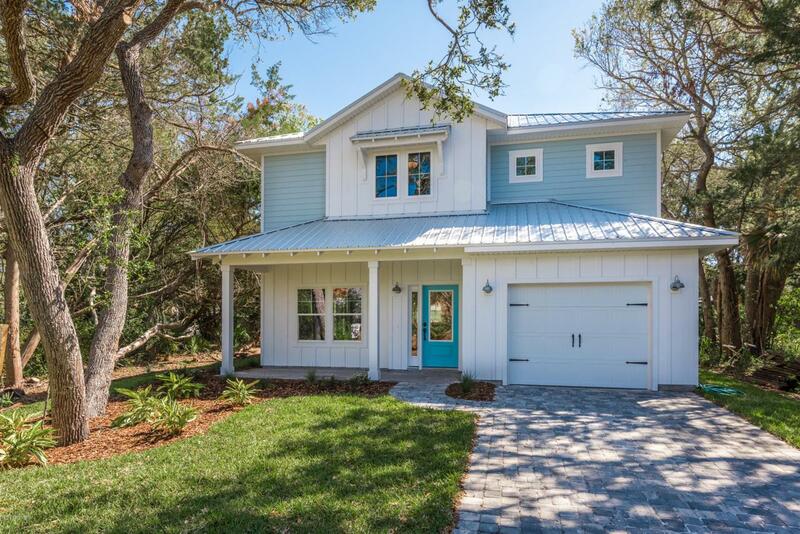 Brand New Coastal Home East of A1A and only a short stroll to the beach! This gorgeous new home is loaded w/quality features like a metal roof, spray foam insulation, Hardie Siding, Low-E vinyl windows & high ceilings. 3BR/2.5BA, loft/bonus room, over-sized 1 car garage offering almost 2,100sf of living area. Upon entry your welcomed by wood floors, 9' ceilings, spacious living & dining room opens to kitchen w/shaker cabinets, tile backsplash, granite tops, 42'' uppers & SS appliances.Situated on a deep lot and offers a large 13X10 covered lanai. The master retreat has a spacious shower with glass enclosure, dual raised vanities and large walk in closet. Good size guest bedrooms, with walk closets and laundry room up. Beautifully landscaped yard with 20X7 covered front porch. Located just a short stroll down the sidewalk to Mary Street Beach ramp! Convenient to shopping, restaurants, boat ramp to ICW and minutes to historic St. Augustine. Short term rentals permitted! Home should be finished in January 2019.